Those of you accustomed to watching 'free' live sport, football for example, on one of the mildly dodgy TV feed websites, will recognise the following scenario. 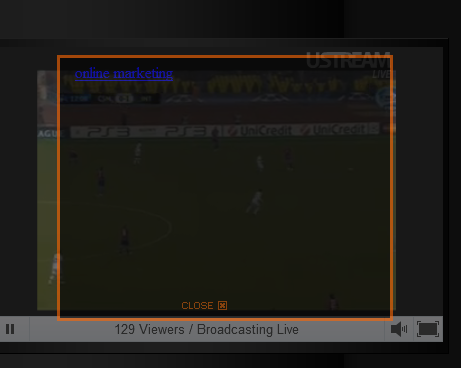 You wait for the stream to load and the first thing that happens is the screen is obscured by a click-through advertisement. Sometimes it will be announced that the ad will close in 20 seconds, sometimes you are given a 'close' button after a short interval. You wait patiently for one of these options - well you have to, don't you? You are doing something a bit naughty and for free, so advertisements come with the territory. These ads are liable to reappear at regular intervals throughout the 90 minutes of football. Presumably - however puzzling you or I might find it - these advertisers are not wasting their money and are getting a return of some sort in visits and sales. You or I might not dream of ever clicking on such an ad, but we recognise that somebody must be. Now I have blogged previously about allowing the silver-surfer (or non-surfing) suits with no adeptitude too much power and control over web content and design. But the reverse is also true. Don't let the inept tunnel-vision techies take over the asylum either! Which brings me nicely, if a teeny-weeny bit unfairly, to Google. Not Buzz, the current number one hot Google topic, but an old standby, Google Books. And not for the usual reasons to do with copyright, access rights, intellectual ownership, commercial interests and so on. No - like the above naff ad trick - this is about bad design, presumably inspired by techie know-how, but little in the way of common sense and logic. First let me state my position clearly. I am a huge fan of Google Books. The basic concept of scanning and making available - free - online as many complete, out-of-copyright books as they can lay their hands on is one of THE great successes of the digital age. It has long since become a resource without parallel and it grows all the time. When I wear my naval and family history research hats I am constantly aware of how much Google Books has helped my work - so saying it has 'changed my life' is not an exaggeration. 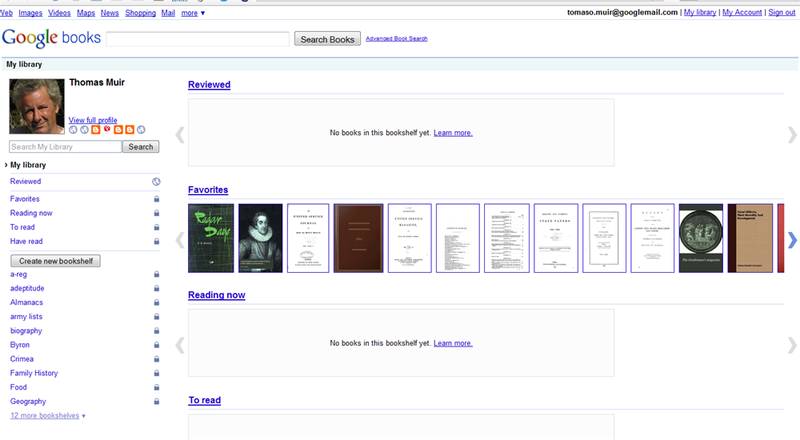 For my research purposes I have a 'Library' at Google Books - literally a bookmarking system. These bookmarks can be divided up into folders, or what they now call 'shelves'. And this is where the problems start. 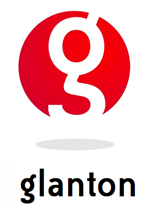 Not satisfied with simply being an online repository of digitalised books, Google have decided they should ape the likes of Goodreads.com and become a social networking book site too. OK, if people want to use Google Books like that, then fine. However, despite all Google's claims about customisability within users' 'libraries', the SN element has taken over: it is right up front, in-yer-face and unavoidable. They have created five default 'shelves' called 'Favorites', 'Reviewed', 'Reading Now', 'To Read' and 'Have Read'. Yes, you can create your own shelves as well - this is the user customisation part. Currently I have 22 of them. These user-created 'shelves' are customisable to the extent you can make them public or private and, most importantly, delete them if you don't need them anymore. But the five default 'shelves' are un-deletable. (You can make most of them private - but where's the logic in that?) Furthermore these five 'shelves' are stuck permanently at the top of your list, taking up hectares of extremely valuable real estate on the start page of your 'library'. WHY? As you will see, four of my five default shelves are empty. (The other, 'Favorites', Google populates for you automatically.) These shelves will always be empty. I don't want, or have any need to use them. I would like to delete them. What kind of techie control-freakery makes Google think it is cute to lumber me with shelves I am never, ever going to use? 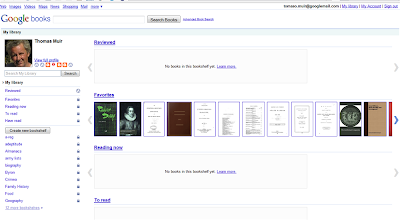 The image above left shows the drop-down 'Options' box for the 'Reviewed' un-deletable shelf. It looks just like this for the other four compulsory shelves. Why? Why set something up to be customisable and then remove some of the options? Below left shows what it should look like: this is the drop-down options for user-created shelves with all the options active, including 'delete shelf'. Yes, of course, if you want to use the social networking aspects of Google Books, then fine. Use them. But how many people are there like me who find this a useless bore? Google may imagine they will get some useful statistics from this set up: perhaps the "Most Read Book" or the "The Book Most Commonly On Users' Shelves, But Left Unread." (Something by Richard Dawkins? - he commented mischievously). But Google can't force me to fill in those five shelves, so why not let me remove them? Empty shelves are no help for their statistics - other than to show how many people don't want them. And in this day and age of almost infinite customisation possibilities - so well exemplified by the likes of DotNetNuke - it is actually so easy to get it right. Why don't Google Books borrow some ideas from their stablemates, Google Blogger and iGoogle? It is almost as if the Google Books team are working in a vacuum, unaware of what goes in other arms of the business, and the current incarnation of their interface is simply, well, shabby. Real customisation, that's the key. Unless of course Google really does have some sinister ulterior motive and are going to insist that all Google Books Library users tell the world what books they have or haven't read and write reviews of them! It might seem far-fetched to criticise in the same breath both a darkside and counter-productive advertising trick and the inept counter-customisation design produced by an Internet giant who should, and usually does know better. But when the details are stripped away, it is clear to me that both aberrations have the same distant pedigree: they are the result of too much reliance on techie expertise and a culture of control-freakery, rather than the application of good old marketing common sense. As I wrote last year in a different attack on bad design, "Don't do it just because you can; do it because you should." Volcanic Fallout: How Did Your Company Shape Up?